Today’s discussion is sponsored by Meijer. All opinions are my own. It’s finally starting to cool down around these parts and I am LOVING it. Summer has never been my favorite season and the fact that I can feel fall right around the corner makes me oh so happy! But with the end of summer comes back to school. Which means our schedules are CRAZY busy with school, sports, extracurriculars, and everything under the sun. Which is why I’m always looking for comfortable yet trendy outfits that don’t require too much effort on my part. 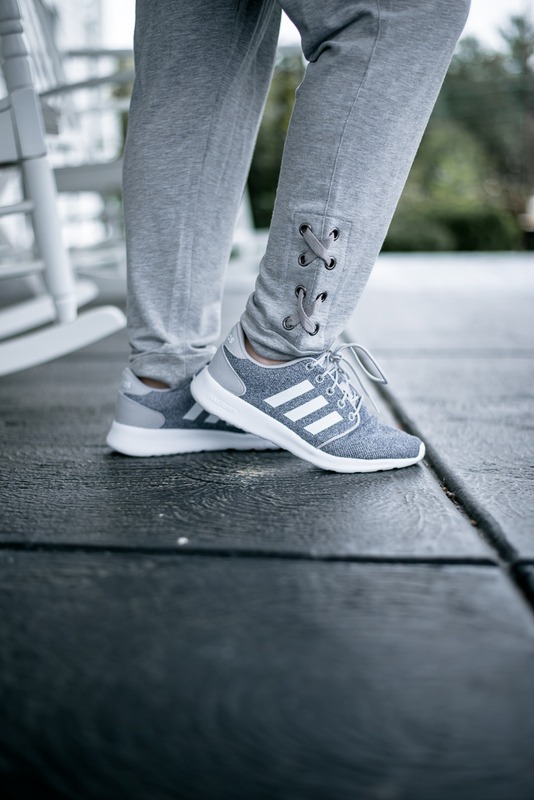 Is anyone else loving the athleisure trend? I mean, who wouldn’t love wearing clothes that feel like pajamas out of the house?! 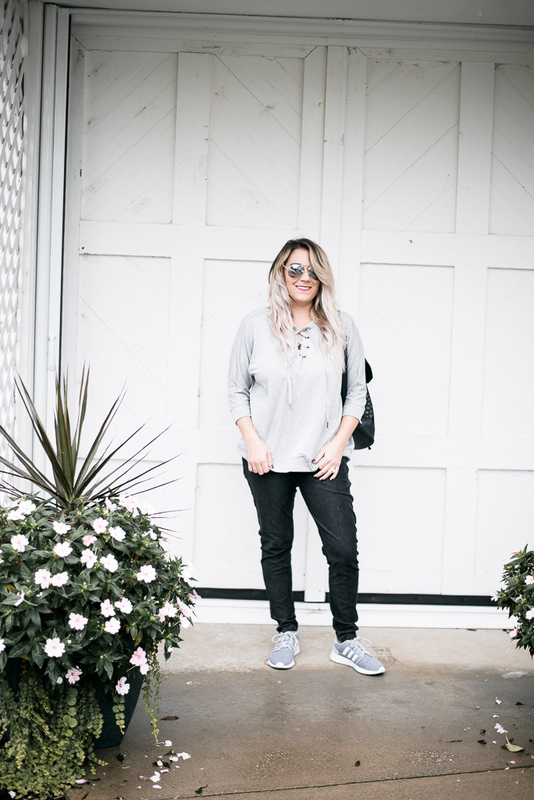 I recently snagged a bunch of basics from The Sweatshirt Project at Meijer so I could mix and match the pieces to create a ton of different looks. They’re all basics so not only could I mix and match them with other pieces from The Sweatshirt Project, but I could also mix and match with any other pieces I already had in my closet. It’s been a rollercoaster of emotions adjusting to my postpartum body and I love that these pieces make me feel good while being comfortable. 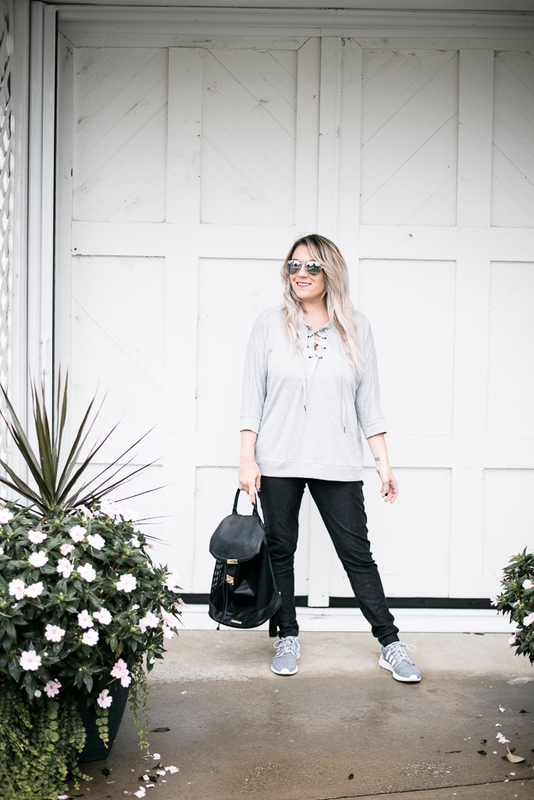 Chasing after three kids, running on zero sleep and being as busy as ever require comfortable yet trendy clothes. So I’m absolutely loving all of these pieces! I chose three shirts, a jacket, and three different pairs of pants and put together six different looks. 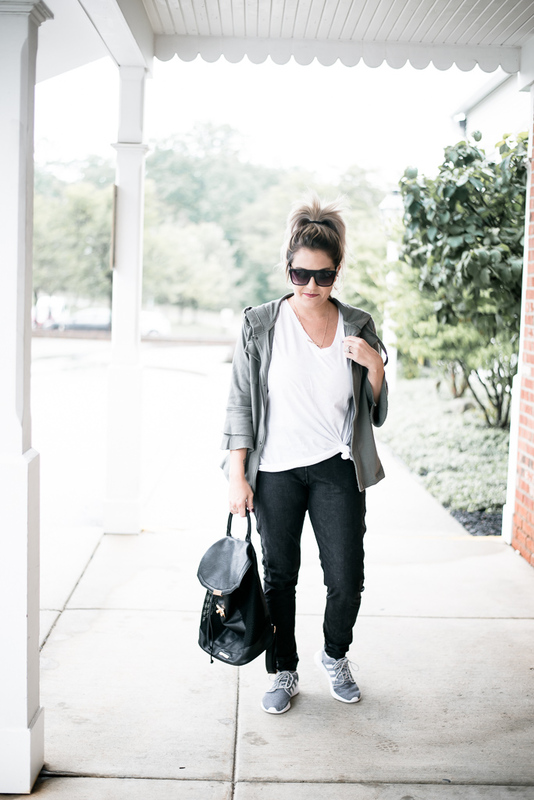 Look one: Gray pants with white tee + Olive jacket. 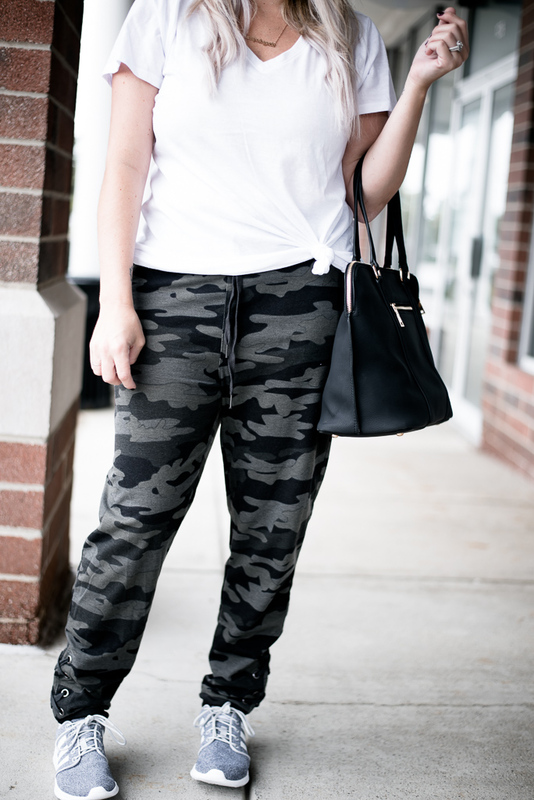 Look two: Gray pants with Camo tee. 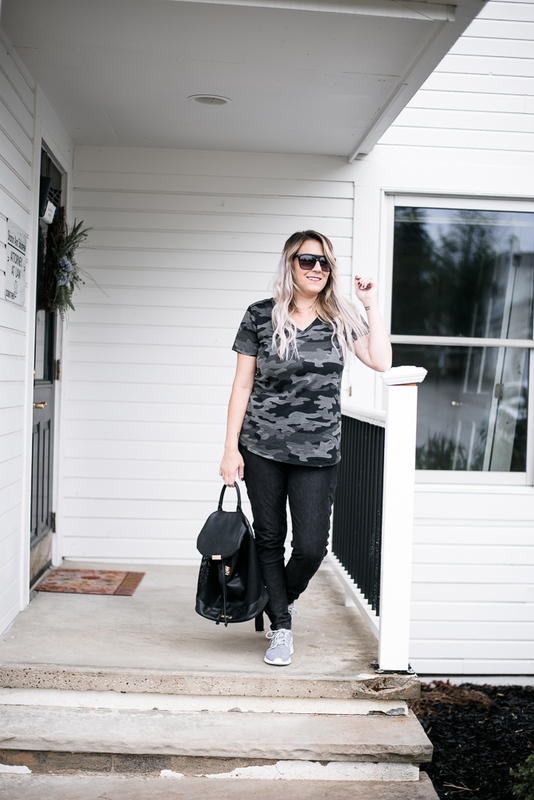 Look three: Black jeggings with Camo tee. Look four: Black jeggings with gray tee. Look five: Black jeggings with white tee + Olive jacket. 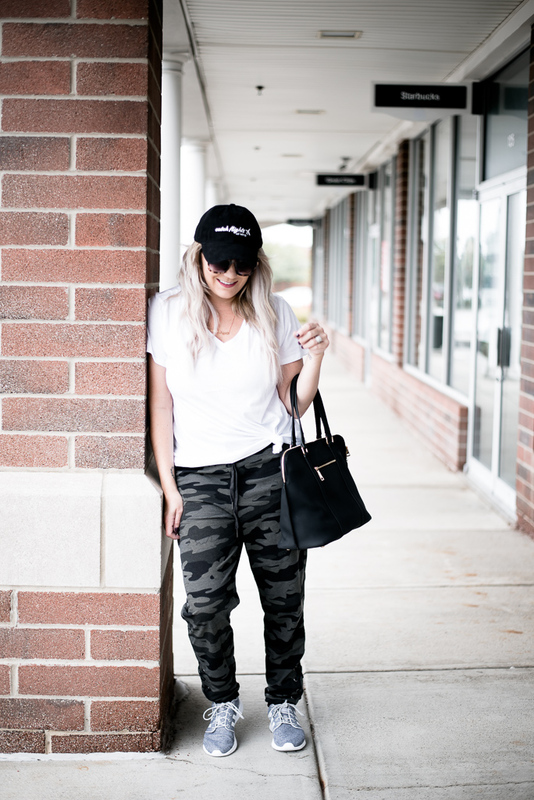 Look six: Camo pants with white tee. I also found this pair of Adidas tennis shoes at Meijer and they can go with all six of these outfits! I love wearing booties and heels just as much as the next person but these are much more practical for my everyday hustle and bustle. And while some people may rock joggers with those types of shoes, I can’t run as fast while chasing after my kids in those. So tennis it is for me! I love how versatile all of these pieces are and can be worn while lounging around the house or leaving it. And that my friends is a win in my book! 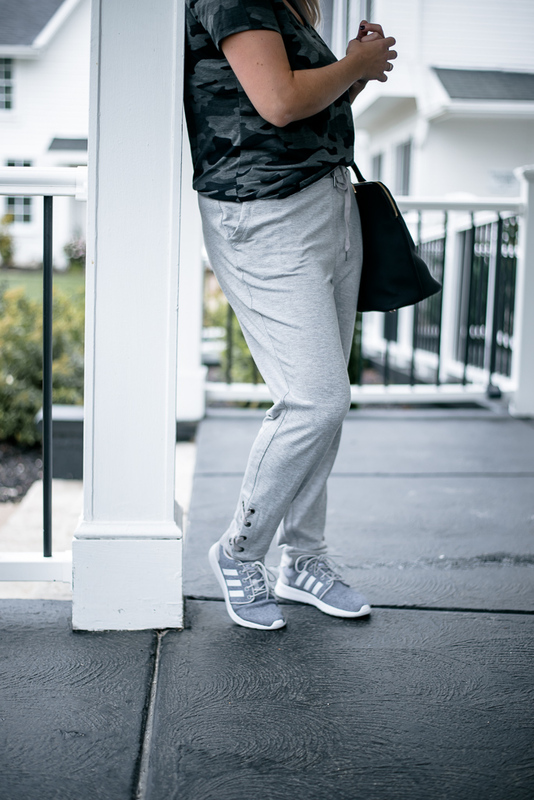 How do you feel about athleisure wear? All these outfits look so comfy yet stylish! goals!! seriously I NEED those shoes. They will match everything! This is like an exact replica of my airport outfits haha. LOVE! 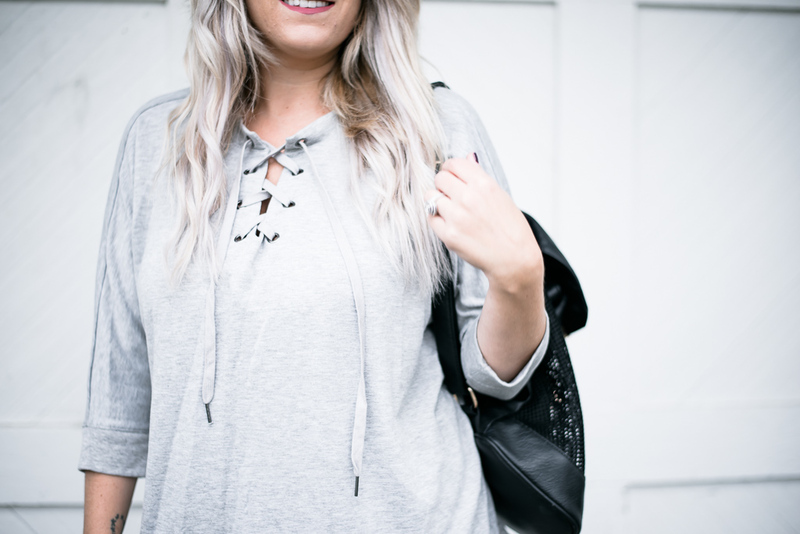 I absolutely LOVE all of these looks – so cute and comfy! plus ya gotta love super versatile clothes! absolutely LOVE all of these outfits – so cute and comfy!! plus ya gotta love super versatile pieces. I’m looking for some new running shoes and these are SO cute! Great photos. Samantha! I love these outfits! I love how you took basic items and really put your own creative spin on styling them! I also LOVE the way you edit your photos, theyre so bright and clean! 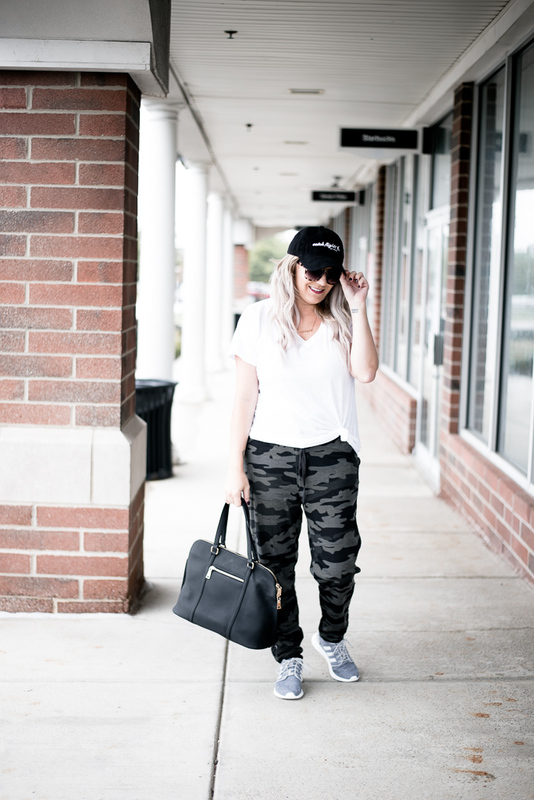 I like how these pieces mix and match and are a step up from just regular sweats! Cute and comfy!! Comfy, casual and chic seem like a smart combination to me! Thank you for the outfit inspo! 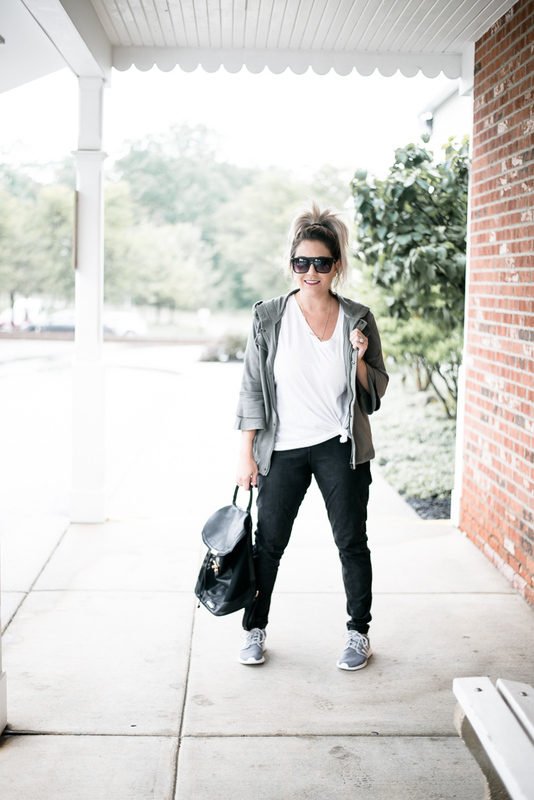 Athleisure is lifeeee, especially in the fall. 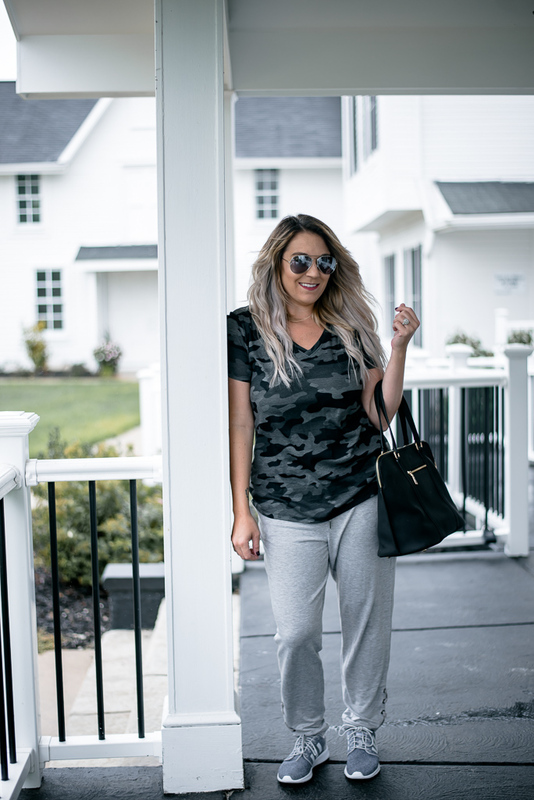 Love the camo sweats! I love the camo joggers! 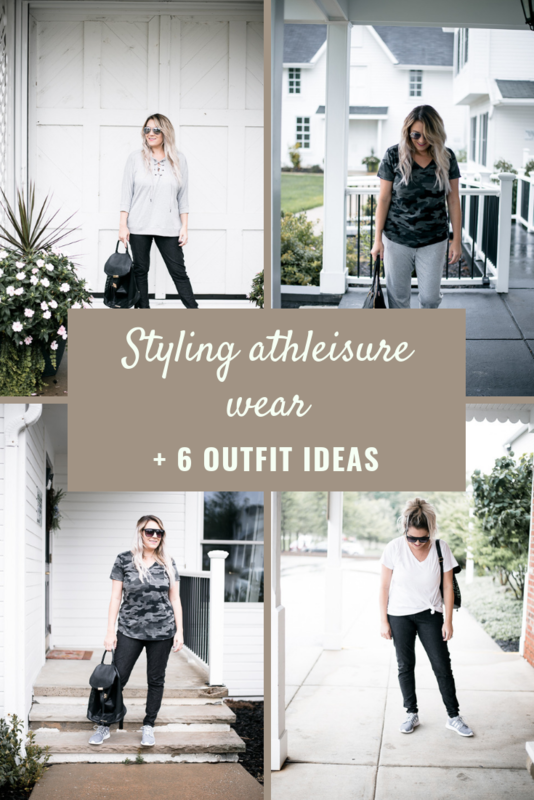 Athleisure wear is my fav for the weekends – just wish I could wear it to work lol! 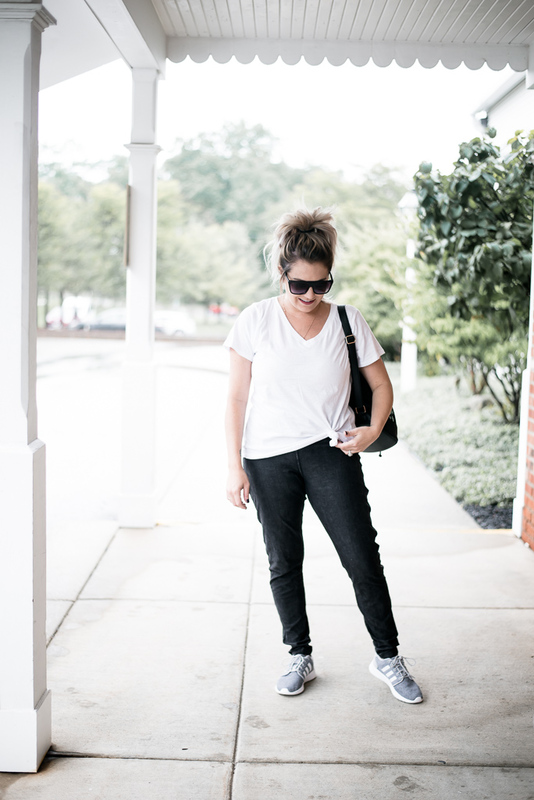 I’m obsessed with athleisure. So comfy, especially now that it is cooling off. I really love all of these outfits. They’re stylish AND comfy. That’s my fave combo. All these outfits are really beautiful, they suit you brilliantly. The shoes, amazingly, they go with everything. This look SO trendy yet still comfortable. 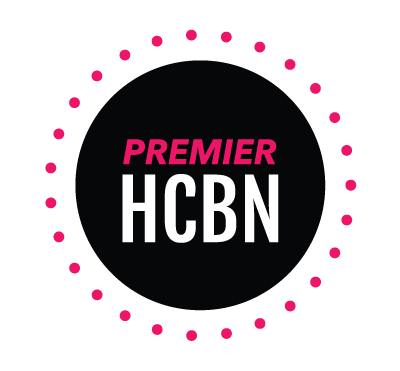 That’s what I’m all about especially as a busy mom of two. Love it! I really love all these looks. They are all so pretty and very comfortable to wear. I dress up for work. This is my weekend look! 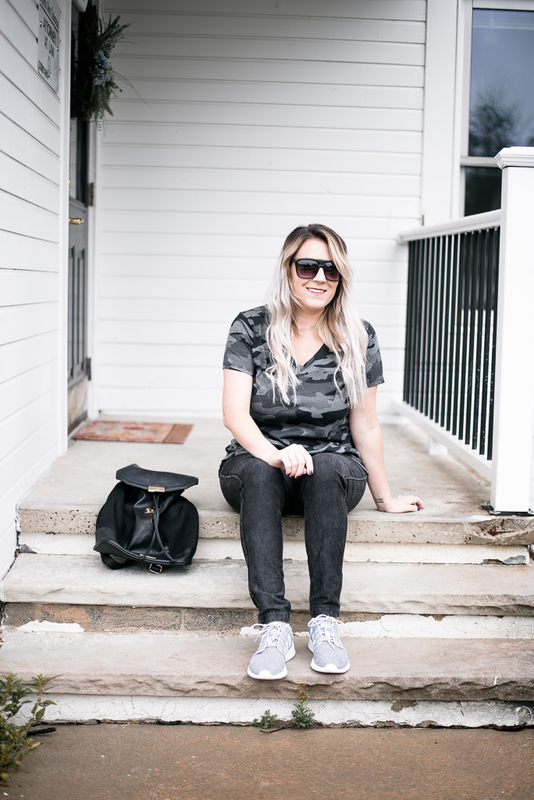 The camo tee, knotted white tee and fabric sneakers are my fave items here! Great showcase of outfits you can wear out of the house. Love these outfits! They all look so comfy and perfect for every day. The grey tee is my favorite piece, I think. Oh I didn’t know about this fashion trend but it is something I’ll gladly adopt! I always wear jeans, so all your suggestions with jeggins look spot on for me! Love the camo pants with white tee combo and that would be great for my mummy and the school run! These outfits look comfy and stylish. I love the camo pants. These outfits look so comfy yet stylish! goals!! I really love your style!! Girl you are looking so fab! I love all of these and how comfy but stylish they look.